This is an update to the February 8th post on the General Faculties Council discussion of the proposed Peter Lougheed “Leadership” Institute. On February 12th, the student newspaper The Gateway quoted President Samarasekera declaring that the Institute has “garnered” the support of the General Faculties Council. This affirms that GFC should always vote on issues brought before the council so that its views may be formally recorded. Here are two further items that pertain to the issue. 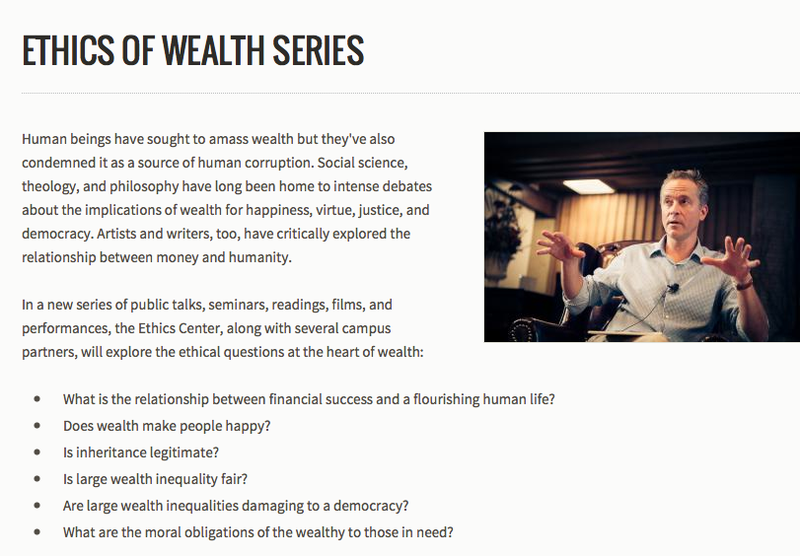 And Stanford University is currently running a series of talks on “The Ethics of Wealth” under the auspices of the McCoy Family Center for Ethics in Society. Wouldn’t it be something if the Administration, in its pursuit of its initiative, considered what truly great universities do to address the issue of “leadership,” and what they choose to offer with philanthropic gifts bestowed under a family name? I for one am more convinced than ever that the name of the proposed institute to be hosted by the University of Alberta should be the Peter Lougheed Institute for Ethical Leadership or Ethical Global Leadership — and that the qualification crucially matters. This entry was posted in university of alberta peter lougheed leadership institute and tagged gateway newspaper ualberta, general faculties council university of alberta, indira samarasekera, laughed leadership institute, mccoy family center for ethics in society stanford, oxford university, oxford university the public humanities, stanford university. Bookmark the permalink. Indeed, we did not have a vote, and not one person who spoke to the Leadership College at GFC spoke in favour of it. All of the commentary was critical, to one degree or another: that is, from members commenting from the floor (of course admin presentations about it were enthusiastic). How can this (speaking of ethics…) honestly have been characterized as “garnering support”? This arrived in my email this morning and I think it indicates a change in the public discourse over what has value. The “market” that drives everything has run its simplistic stories of money being the only social value into the ground. That’s a very effective ad. There’s something more to us than making gadgets and privileging narrow groups that want more of less for others. Even the simplest of stories like a work order or an accident report need to speak to us so we can understand and act. I think people are tired of the “lower your expectations–we can help” story that seems to be the message from the top in education and government. The need for ethical leadership has never been more pressing than now. Edelman, a global PR firm just released the 2014 Edelman Trust Barometer. This is a global trust survey that focuses on the publics’ trust of key institutions and leadership. It will come as no surprise that Canadians trusted government the least (51% trust rating), NGOs the most (67% trust rating) with the media (58%) and business (62%) falling in between. Edelman asked who we trust to tell us the truth and to make ethical decisions. Academics scored the highest at 67%, NGO representatives came in at 52%, CEOs at 43% and government leaders at the bottom of the scale at a pathetic 36%. Alberta’s government and its leadership work hand in glove with business, primarily the energy industry, to ensure that corporations generate great wealth for a privileged few, while at the same time under-taxing corporations and the wealthy so critical social programs like education and healthcare are chronically under-funded. Government and business would benefit from a healthy dose of “ethics”. Including the word “ethical” in the name of the Peter Lougheed Leadership Institute would be a good first step.